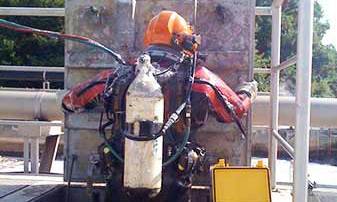 Diving in clarification plants requires special equipment and years of experience. 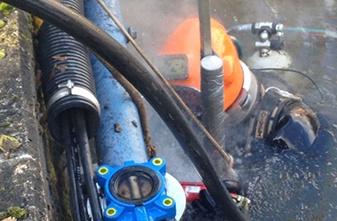 In many parts the sewage water is bacterially contaminated and diving is therefor just possible with a closed system. Absolute impermeability of the diving suit and helmet is essential for survival. The diving itself takes place in complete darkness. 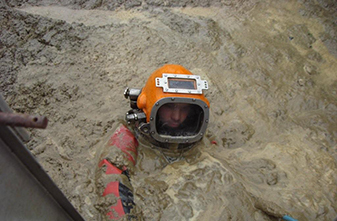 Through radio contact to the team members outside of the water and touching the diver orientates oneself in the contaminated water. The advantage for the operator of the sewage work is the big saving of time and money because the basins don't need to be dewatered. 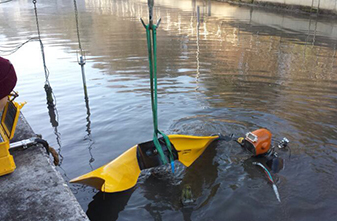 Our experienced divers for clarification plants take over operations throughout europe. Get in contact with us. We are pleased to provide you advise personally and create an offer at no charge for working in sewage works europewide.